This Sunday is Lag B’omer! You might be gearing up for a bonfire, scheduling a haircut, or getting ready for a simcha, but don’t forget to prepare spiritually for Lag B’omer as well! In Jerusalem, or New York — wherever there are Jews who are loyal to the Torah — children and their teachers take to the fields with bows and arrows; brides and grooms march to the chuppah; shuls and yeshivos fill to mark the sacred happiness of the day. What is it about Lag Ba’Omer? What transformed the days of Sefiras Ha’Omer — the forty-nine days between Pesach and Shavuos — from happy anticipation to somber mourning? What is the significance of the unusual Omer offering? Rabbi Shimon Finkelman’s comprehensive sefer, Lag B’omer, provides the answers to this, as well as anecdotes and insights, plus history, customs and lessons applicable to this special day. This week, we’re presenting a sample chapter, filled with stories about Lag B’omer and Rabbi Shimon Bar Yochai. 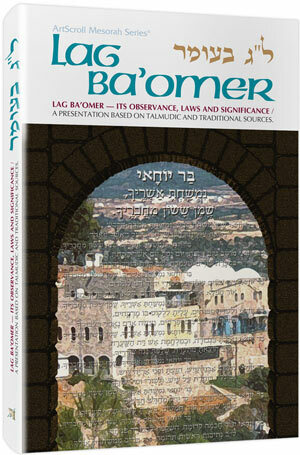 Click here to view, print or download a sample chapter from Lag B’omer. **Don’t forget to enter our HUGE giveaway! The grand prize is a complete Schottenstein Talmud! Click here to enter. Click here for all books by Rabbi Shimon Finkelman.